Ultra-smooth, super composite interior wall is easier to clean, fully resistant to swelling and is less likely to fray, making loading and unloading from the mandrel much easier while drastically reducing the chances of it getting stuck. Sealed super composite sleeve is easier to clean due to the smooth surface, making removal of even dry ink quick and easy. 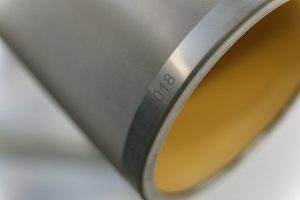 AST features corrosion proof, mechanically anchored and fastened stainless steel end caps that are an integral part of the sleeve construction without use of adhesive to prevent the end caps from dislodging. 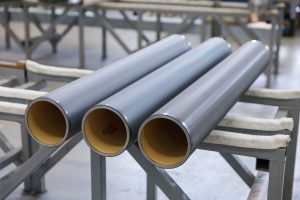 AST is completely liquid resistant and will not delaminate as a result of liquid penetrating the sealed construction, which is one of the main reasons an anilox sleeve can fail prematurely. Apex industry leading 0.015mm (0.0005”) max TIR and OD is designed for speeds up to 600 meters (2000 ft) per minute with no bounce. 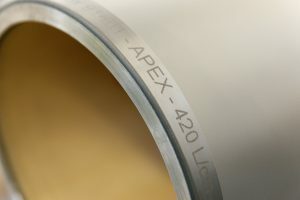 Because Apex controls the manufacturing process, there is no middle man to add cost, inventory is readily available, and our stock program supports 10 of the world’s premier OEMs. How Can GTT Benefit Me Today – And Tomorrow? What Can Accora Glue Sets Do For Me? Why Is Apex The First Choice In Corrugated Anilox & Glue Sets?